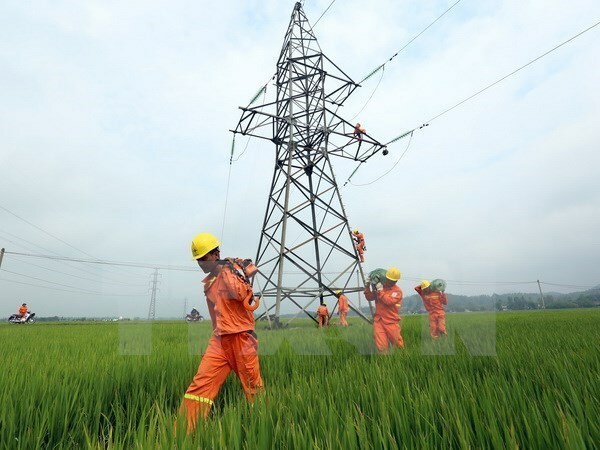 Hanoi (VNA) – The Electricity of Vietnam (EVN) Group and its subordinate firms cut down production and business costs by more than 1.25 trillion VND (55.2 million USD) in 2017 thanks to their efforts to improve business effectiveness and productivity. The group reported its operation outcomes in 2017 at a conference held in Hanoi on January 4. EVN Deputy General Director Vo Quang Lam said by the end of last year, the firm had directly provided electricity for 25.6 million customers, an increase of 0.8 million from 2016. EVN and its subsidiaries encountered an array of difficulties in 2017, Lam said, noting that natural disasters and abnormal weather caused damage of over 600 billion VND (26.4 million USD) for the power system. Increases in prices of coal and gas for electricity production, water resource tax, and forest environmental service fees also hindered the financing of power projects, he said. Despite these facts, the group produced and bought 192.45 billion kWh of electricity in 2017, up 8.6 percent from the previous year, ensuring power supply for socio-economic activities and major events like the APEC Economic Leaders’ Meeting. The EVN operated the electricity system and market in accordance with demand, optimised power generation sources, and capitalised on hydropower while ensuring water for irrigation in downstream areas. Lam highlighted that all electricity-relevant services of EVN have been provided online since the end of 2017 to improve service quality. In the Doing Business report, Vietnam’s Getting Electricity index last year climbed 32 places from 2016 to rank 64th among 190 countries and economies. It surpassed the 70th position targeted by the Government, thus greatly helping to improve the business environment and national competitiveness. He added the group’s System Average Interruption Duration Index (SAIDI) was 1,077 minutes, down 35 percent from 2016. Notably, the Ho Chi Minh City Power Corporation recorded a 54-percent decline in its SAIDI to 235 minutes. According to the EVN leader, productivity rose 9 percent year on year to 1.92 million kWh per person.